Three members of our dance/dinner club are gluten-intolerant so I am always looking for recipes to accommodate their dietary needs. 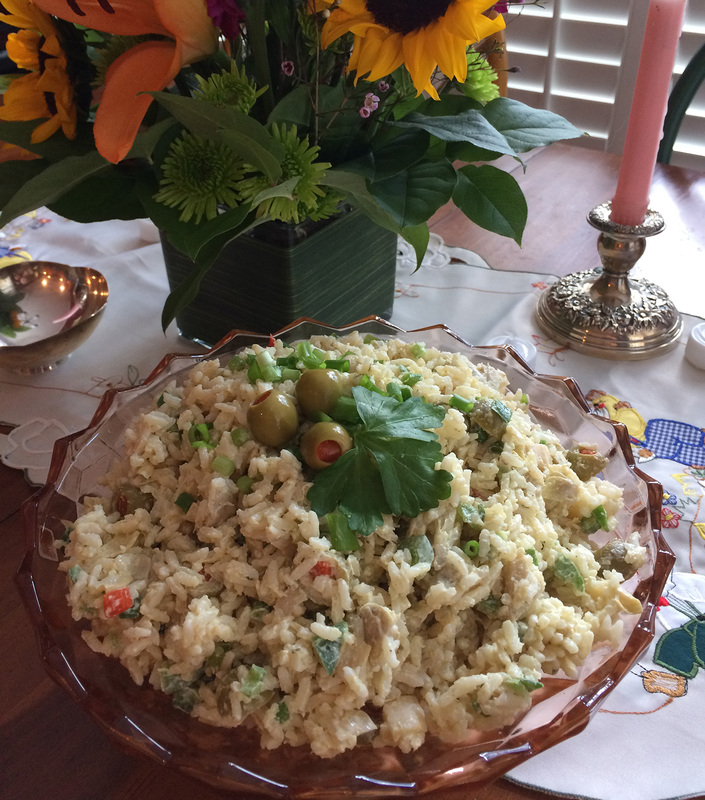 I have a recipe for a curried rice salad, which everyone likes, but I wanted to try something different for our last gathering. Spring Onion Salad is easy to make and take. My spring onions are coming in, but a late cold snap slowed their growth so I didn't have any from my deck garden to experiment with. Fortunately, our close by Publix supermarket had a fresh supply of spring onions from Florida so I picked up a couple of bunches to use in making salsa and salads last week. Everyone liked my adapted Spring Onion Salad – even my gluten-tolerant dancing friends. Enjoy. Serves 8 to 10. Recipe is by Tommy C. Simmons. Cook the rice as directed on the package in chicken broth instead of water. If you can't find Mahatma Gold par-boiled rice, white or brown rice will work fine. You can also use a vegetable broth in place of chicken broth if accommodating vegetarians. Cool rice in a large bowl. Add the spring onions, bell pepper and olives and mix. Drain the hearts of palm and artichokes reserving the marinade. Chop the hearts of palm and artichokes and add to the rice salad. In a small bowl, combine the curry powder, red pepper and mayonnaise. Stir in amount of reserved marinade to make a smooth, but thick, salad dressing. Testing note: Season to your taste preference. I usually add more curry powder and sometimes I also add dashes of smoked paprika and ginger.